Avoid accidents in the workplace by clearly displaying forklift signs to warn pedestrians and other vehicle users that forklift trucks are operating on site. Featuring the forklift symbol in compliance with BS EN ISO 7010, these forklift truck signs comply with the latest sign legislation. Forklift trucks, due to their purpose and design, can cause serious collisions and accidents if not operated responsibly or if appropriate safety precautions are not taken in their use. Displaying clear, easily visible Forklift Warning Signs on your premises can be extremely helpful in promoting safety and best practice in the workplace. See our range of sign fixings for solutions to permanently affixing your safety signs and our buying guide for more information. Forklift truck accidents are unfortunately quite commonplace in the workplace due to their purpose and the risks associated with this. Those operating this dangerous piece of lifting machinery should adhere to your safety regulations in place to ensure that they are not endangering the safety of themselves or others. All forklift drivers should also be fully equipped with relevant safety equipment, for example, protective clothing such as hard hats and High Visibility Clothing. Before beginning their shift, each forklift truck driver should check over their vehicle to assess it for damage, mechanical faults or any other potential hazards. While operating the machinery, they should also take advantage of operator restraints where fitted. The same level of vigilance should be applied to manoeuvring a forklift truck as you would apply to driving a car – assess your surroundings before setting off, always keep your eyes in the direction you’re travelling, watch out for obstructions in your path, travel at a speed suitable for the location and load being carried, and drive with the forks lowered but clear of the ground. Drivers should avoid sudden stops or violent braking, slow down when approaching corners, doorways or blind spots, and sound the horn where they see fit or when instructed to do so – for example, where a sign tells them to sound horn. Other helpful tips to bear in mind for safe forklift truck operation include applying the parking brake when leaving the vehicle; always using the steps and handholds provided to avoid trips or falls; and implementing a forklift inspection system to ensure vehicles are inspected daily. There are a variety of safety messages to consider when it comes to forklift truck safety, and clearly displaying these in locations that are highly visible to staff, drivers and members of the public will significantly reduce the risk of accidents occurring on site. 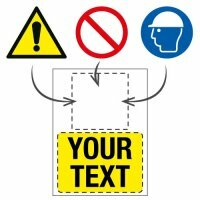 Our huge selection of safety signage is available in various orientations, sizes and materials, and with differing messages. Messages warning of the dangers of electric vehicles operating within the area and caution forklift trucks are available to promote and encourage vehicle safety and protect those on your premises. We also provide other warning signs which will warn employees and visitors of any risks in the workplace. 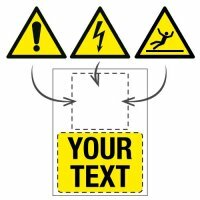 In the unusual circumstance that you’re unable to find the exact Forklift Warning Sign you have in mind, you can customise and create your own design through our cutting-edge on-line Custom Safety Signs service. Simply select the size and material required, choose the relevant symbol and add your own wording. Should you need any advice at all, our team of expert advisors will gladly assist you with any queries you may have, ensuring that forklift safety on your premises is second-to-none.